This is an interesting book on the relatively recent awakened ecumenical consciousness of the Roman Catholic Church. The author traces in detail the history of schisms and the protestant reformation before going on the explain what dialogues are now firmly underway between the Church and various other Christian churches. The guiding vision of “koinonia” he explains, is about building relationships with God, one another and the world rather than insisting on “a return to” or seeking only to reestablish the primacy of the Pope over all Christians. It was the Vatican II Council that set this new tone and direction with such documents as Unitatis Redintegratio (Decree of Ecumenism) (http://www.vatican.va/archive/hist_councils/ii_vatican_council/documents/vat-ii_decree_19641121_unitatis-redintegratio_en.html ) The theologian Yves Congar is quoted many times and given much credit for this awakening. While there is considerable hope for reunification between the Roman Catholic and Orthodox faiths, contemporary barriers to additional progress are many. The nature of ecclesial communion remains a big stumbling block. Catholicity requires communion i.e., union of all the local churches and with the church of Rome. Congregationist and other non-episcopal churches have only loose bounds to each other by their very nature. Ministry including recognizing the orders of other Christian communities, the role of women, marriage of clergy as well as the effective functioning of the papacy in a world community of churches, requires much much more investigation. Finally, the presence of neoconservative movements is without doubt, antiecumenical and can impede progress. The aim of intereligious dialogue is different. The Church holds dearly that there is only one redeemer of people, Jesus Christ. But the Church professes in Nostra Aetate (Relation of the Church to Non-Christain Religions) ( http://www.vatican.va/archive/hist_councils/ii_vatican_council/documents/vat-ii_decl_19651028_nostra-aetate_en.html ) that God has a means of extending salvation to members of other faiths by means we may not fully comprehend. A second conciliar teaching is that the right to religious freedom has its very foundation in the very dignity of the human person. It is acknowledged that these non-Christian religion do immense good in this world. Consequently the Church rejects nothing that is true and holy in them. The author falls short of mentioning what can and is taking place between the Church and members of Traditional Religions (native African and other indigenous peoples religions). I found this book informative but was disappointed that there is no call to action for lay people. There is little or no mention of the appropriate role of the laity in ecumenism and interfaith dialogue. Such dialogues are going on between committees of church authorities and theologians behind closed doors. While progress is being made, it is not something we hear about on Sunday morning. We are increasingly aware of such organizations as the World Council of Churches and the annual prayer service for Christian unity. However at the local level, we are often not sure of ourselves and may look to our clerics for direction. 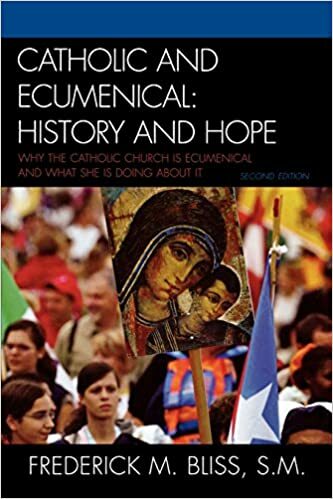 Perhaps there is need for a sequel on how lay people can take more control and get involved in the ecumenical movement. This could help us ward off the troubling trend we see around us that “a stranger is an enemy”. It also might help families deal better with mixed marriages, multiple religious traditions and neigbours in our increasingly pluralistic world.